From today until next Friday, April 8th, the free KTQ50 film is What's Happening at Local 70? (1975). Striking workers in one Chicago unemployment compensation office talk about working conditions that led to a walkout in July, 1975. Workers and claimants suggest possible solutions to the problems of understaffing and compulsory overtime. 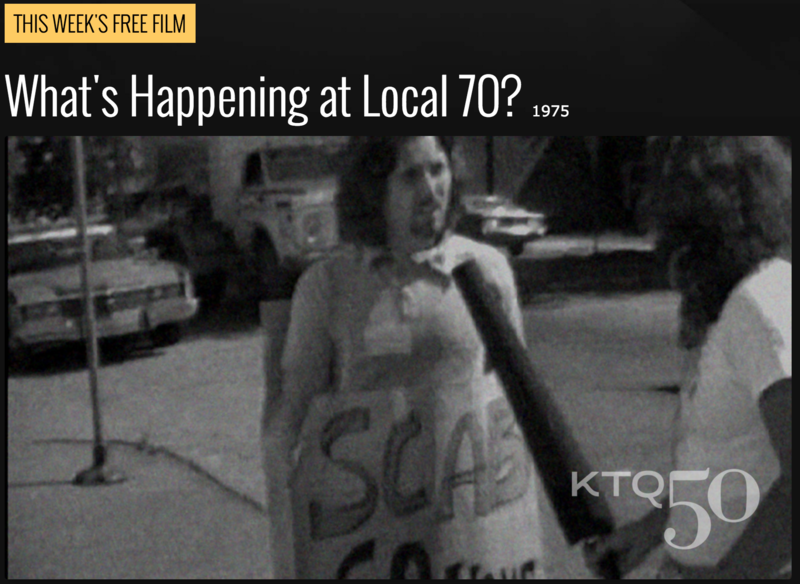 Directed by Kartemquin Collective member Judy Hoffman, What's Happening at Local 70? was shot on 1/2 inch videotape using a Portapak and edited in-camera, before being shown to other offices to encourage them to support the strike. Utilizing the grassroots power Kartemquin is now well known for, they held screenings for the next nine weeks of this film in bars and restaurants near local offices followed by public discussions. At a Chicago-wide meeting, union officials tried to suppress the viewing of the tape, but in the end the Director of Unemployment Compensation for the State of Illinois was fired. The film stands as record of effective and immediate social impact documentary making. What's Happening at Local 70? is available on DVD through Labor Stories. Series of stills: a selection of behind the scenes stills from the film of the picketing and strike action. Now available for purchase The Kartemquin Collection Volume 4: The Collective Years featuring Now We Live on Clifton; Winnie Wright, Age 11; Viva La Causa; and Trick Bag. All four films are released on DVD for the first time, in digitization of original 16mm prints newly restored through a grant from the National Film Preservation Fund. Get more information and order your copy here. The film's director, Judy Hoffman, recently stopped by the studio to participate in a series of recorded conversations with Kartemquin's Director of Communications and Distribution, Tim Horsburgh. She has worked in film and video for over 40 years. She was active in the Alternative Television Movement of the early 1970's, experimenting in the use of small format video equipment, and was the first female Camera Assistant in Chicago. Hoffman joined the Kartemquin Collective in the early 1970s and continued to play a major role in the organization for many years, working on many of their film productions, including as the Associate Producer on Golub, which debuted at the 1988 New York Film Festival. She is still an active member of Kartemquin, and is a respected professor at at the University of Chicago Department of Cinema and Media Studies and Department of Visual Arts. Listen to the full interview here.